The survey of 603 adults, conducted by the Wisconsin Policy Research Institute (WPRI) between Feb. 27 and March 1, included a question asking respondents whether they are likely to vote in the 2012 elections. Poll respondents typically overstate their true voting intentions on these sorts of questions, and the WPRI survey is no exception: Nearly four out of five respondents (79 percent) said they are "almost certain to vote," while another 8 percent said they will "probably vote," even though the actual turnout among eligible adults in 2008 was 72.1 percent. Nevertheless, these responses provide a crude indicator of intentions, as those who say they intend to vote are more likely to turn out. 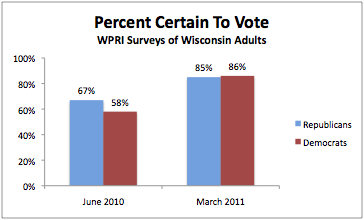 Thus, when WPRI asked a similar question on a survey conducted in June of last year, they found fewer Wisconsin adults (57 percent) who said they were "almost certain" to vote in the 2010 general elections. Again, actual turnout among eligible adults was even smaller (51.7 percent), but the responses are a guide that help pollsters sort out the most likely and least likely voters. In June of last year, for example, WPRI found a considerable gap in vote certainty between Republicans (67 percent) and Democrats (58 percent). But the just completed survey shows roughly the same number of Republicans (85 percent) and Democrats (86 percent) who say they are "almost certain" to vote next year. Those differences may seem small, but they make a big difference in the composition of the likely electorate. Consider the same questions tabulated a different way, by comparing the party leanings of those who said they were "almost certain" to vote in 2010 with those who now say the same about their intentions regarding the 2012 general election. 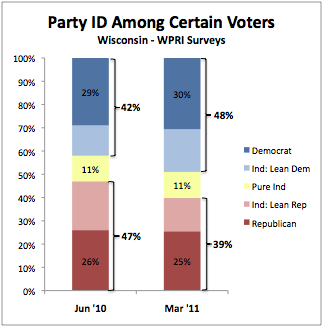 When WPRI asked the classic party identification question -- including the follow-up that asks independents how they lean -- they found Republicans had a 5 percentage point advantage with leaners included (47 percent to 42 percent) in June 2010. But on the survey conducted last week, Democrats had a 9-point advantage (48 percent to 39 percent) among the most certain voters. So while last year's survey of Wisconsin showed the same enthusiasm gap favoring Republicans that pollsters found nationwide, that gap had vanished in the survey conducted last week. In Wisconsin, where Democrats outnumber Republicans among all adults, that shift translates into roughly the same Democratic advantage that the party enjoyed in 2008. What is unclear from these data is how much of the renewed Democratic enthusiasm is a reaction to Gov. Scott Walker's efforts to eliminate collective bargaining rights for Wisconsin's public unions and how much reflects the typically higher turnout among key Democratic constituencies -- particularly younger and nonwhite voters -- in presidential elections. As such, these results may not reflect voter intentions regarding any special recall elections that may occur this year, especially since the key question asked about whether respondents plan to vote in the 2012 presidential election. Surveys geared more specifically to any potential recall election, such as the reportedly soon-to-be-released surveys sponsored by MoveOn.org, will help answer those questions.